So pleased to have in our boutique the gorgeous Liesl and Liesl Lynette by Rebecca Ingram. To give you masses of choice we have samples in both size 8 and 22 and are showing them in both lovely colours, Antique Ivory and Ivory over Blush. Liesl Lynette is the same gown, but has extra coverage for a fuller bust and is cleverly built up more at the back to hide a bra strap. No more guessing! Great sizes and both colours to try. We are delighted to share our brand new website with you and very excited to see it ourselves! Thank you to Ben and Lucy Davis at Pallant Digital for such a lovely job! 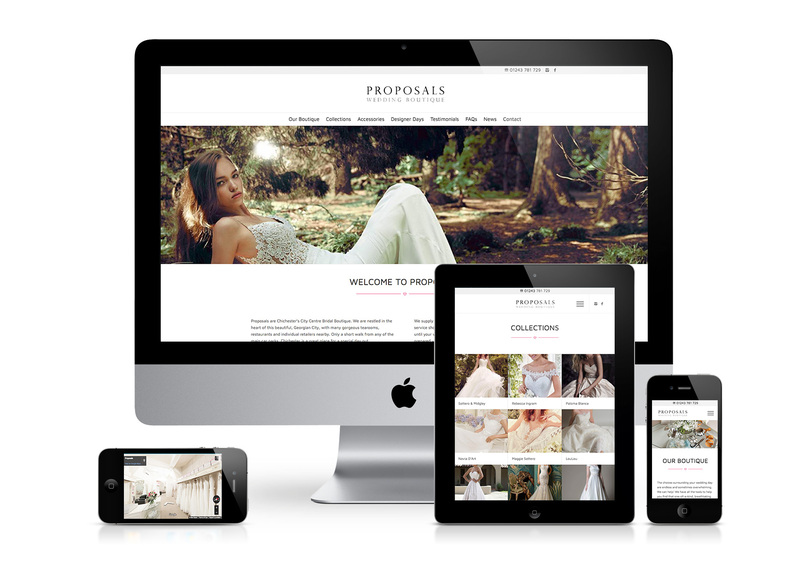 You will find a fresh new look for Proposals, with some gorgeous images and of course lots of lovely dresses to browse through. Our site is now mobile-friendly so that you will be able to use all the features when you are on the go. Along with new links to our social media channels, there is also a great 360° walk through shop feature for you to explore. We have also added an FAQs page to assist you with a whole range of queries. To celebrate our new website, we will be giving away a beautiful lace garter to the first 10 brides to book a consultation using our website’s contact form!